You may wish to photograph a performance such as a play or concert that takes place on stage with stage lighting. Stage lighting presents a challenge for the automatic metering system in most cameras. The undesirable results are typically the people on stage are washed out or over-exposed. Below is an outline of some tips that will improve the quality of your stage lighting images as you capture photos of your favorite performances. This Photo Tip is written with digital cameras in mind, although many of the techniques that follow apply to film cameras as well. 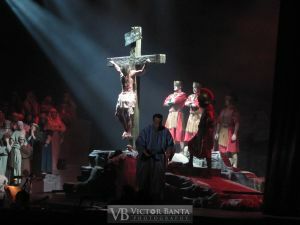 Christ on the Cross: Taken at Northridge Church’s Glory of Christmas show, illustrating the result of the techniques outlined in this Photo Tip. For illustration purposes, this image is unedited. Image details: ISO 800, f/5.0 at 1/25 second, Exposure Compensation -1 stop, No Flash. ©Victor Banta. Stage lighting presents a challenge for photographers and cameras. In most cases, flash photography is prohibited and distracts from the experience. Many of today’s digital cameras allow the user to adjust exposure settings. For stage lighting, we want to capture as much of the stage lighting as possible, while making sure the performers are captured with the best exposure. Below are some camera settings that will improve the quality of your images. Note, not all cameras allow adjustment of all of these settings, try as many as you find on your camera and improve your stage photography. Turn off the Flash. With many point and shoot camera unless you are less than 10 feet from the subject, chances are your flash will not benefit the exposure. Turning the flash off allows the camera’s shutter speed to go slower, saves battery life, and does not distract others. Increase ISO setting (film speed) to 400 or 800. There is a secondary advantage to this, the higher ISO will allow for a faster shutter speed, thus reducing image blur due to movement. NOTE: Do not set too high, because at higher ISO settings the image noise will increase and image resolution may be reduced. Shoot in the Av (aperture priority) setting if you have one. Typically, this allows access to more camera functions opposed to “Auto”, “Scene”, or “Program” shooting mode. Open aperture all the way up to largest opening. The smaller the number, the larger the aperture. The larger the aperture, the more light into the camera. There is a secondary advantage to this, the larger aperture will allow for a faster shutter speed, thus reducing image blur due to movement. NOTE: When the lens is zoomed in to a longer focal length, the maximum aperture size is reduced. An aperture of f/3.5 is a larger aperture and let’s in more light than f/8.0. Set the light metering sensitive area to spot (the default setting might be something like Average or Evaluative.) Spot metering allows you to measure the exposure in a smaller area, in this example avoiding all the dark areas that would cause an over-exposure of the subject or region of most interest. Capture a photo and take a minute to analyze it to see if the image is what you want. I call this “Shoot and Review“, this is a good mantra for photographers. When the camera is in the image review mode, most cameras allow you to zoom in on the image to see some of the detail. If the key subject in your image is too bright, you will have to under-expose the next image by 1 to 2 stops as a good starting point. Depending on the camera, there may be an Exposure Compensation control with a typical range of -2 to +2 stops with 3 steps between each number or Stop. Adjust the Exposure Compensation from the ‘0’ default to ‘-1 or -2’, thus under exposing the image 1 to 2 stops and making the subject darker. If your camera does not have an Exposure Compensation adjustment, you will have to “trick” the camera’s light meter by pointing the focus spot at something bright at a similar distance as your subject, push the shutter button halfway down and hold to lock focus and exposure, then while holding the shutter button re-position the camera with the desired framing and expose the image. This same exposure trick will come in useful for all kinds of lighting situations where you have to adjust exposure to get the image you visualized. Please let us know if you have questions. Have fun, good luck, and happy shooting! Victor Banta also teaches photography classes, offers one-to-one photography lessons, and offers travel photography adventures that include photography education World wide. Please contact us for scheduling.